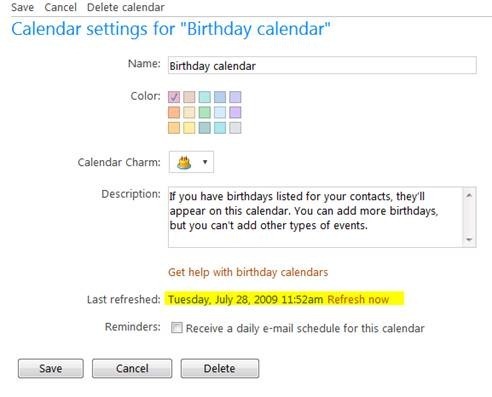 In conjunction with retiring of Windows Live Events, Microsoft updated “birthday” features in Windows Live Calendar. Under “New” menu, there’s now a “Birthday” menu item. Previously, “Birthday Calendar” would automatically fetch the birthday details from Windows Live contact list, however you can only enter them using Windows Live People, Messenger, or Mail, and it would (occasionally) sync with your Calendar. With this new update, you can now add birthdays right from inside the birthday calendar and they’ll automatically sync with your contact list. 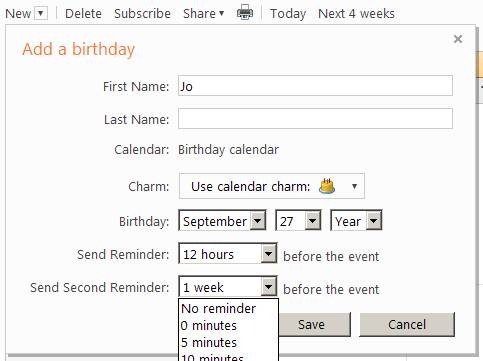 When you add a birthday, you can call attention to it with a special charm and you can set a second reminder. If you don’t like the birthday calendar, you can turn it off or delete. Deleting birthday calendar doesn’t change your contact list, and you can always add birthday calendar back later. There’re a few other additions to settings page: you can also change default charm that goes with birthdays. And you can refresh calendar to have all latest birthdays from your contact list.